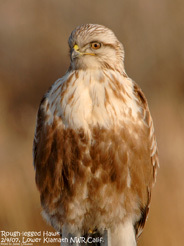 Only Two Spots Left For Our Malheur Birding Expedition! Our always popular Malheur birding trip is scheduled for June 2nd-5th, 2018! This five-day and four-night eastern Oregon birding expedition will begin with birding from Ashland to Summer Lake, exploring surrounding wildlife areas, and stay at the Summer Lake Lodge. 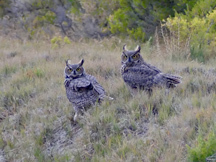 On the second day we will arrive at the Malheur National Wildlife Refuge—birding this special area the next three days with accommodations at Crystal Crane Hot Springs those three nights. Bring your swim suit as we will study the night sky from the warmth of the hot spring pool in the evenings (optional of course). One night we will have dinner at the famous Diamond Hotel. Dinners will include tallies of our birds for the day. Some of the species we hope to see: Cinnamon Teal, Trumpeter Swan, White-faced Ibis, Sandhill Crane, Ferruginous and Swainson’s hawks, Bald and Golden eagles, nesting Long-billed Curlew, Wilson’s Phalarope and Wilson’s Snipe, Franklin’s Gull, Black Tern, Prairie Falcon, Great Horned and Barn owls, Common Nighthawk, Loggerhead Shrike, Eastern Kingbird, Gray Flycatcher, Say’s Phoebe, Black-billed Magpie, Rock and Canyon wrens, Sage Thrasher, Mountain Bluebird, Sagebrush and Brewer’s sparrows, and Yellow-headed Blackbird. 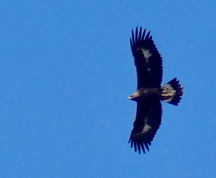 We have seen as many as 142 species on this trip in the past. Cost of the trip is $575 which includes modest accommodations, dinners, transportation (a small van will be available plus there will be room in vehicles), and the expert guiding of birding extraordinaire and bird guidebook author Harry Fuller. 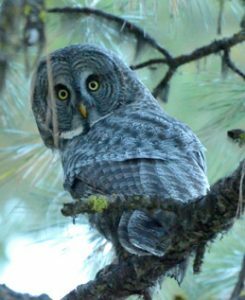 $300 of this will be a tax deductible contribution to the Klamath Bird Observatory so not only will you have a fantastic adventure in a very special part of the world, you’ll contribute to bird and habitat conservation efforts. Participants will need to bring breakfast and lunches. Sign up by contacting Shannon Rio at shannonrio@aol.com or call her at 541-840-4655. 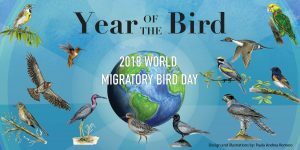 Year of the Bird in May – It’s a Global Big Day! It’s May in the Year of the Bird and our call to action is Global Big Day! Saturday May 5th is the day people all over the world will be watching birds and putting them on the world map via eBird. What to do: Look for birds and report what you find at eBird.org in this exciting 24-hour quest to collectively record as many bird species as possible across the world. How to do it: Watch birds on May 5th –any time from midnight to midnight in your local time zone. It’s that simple. You don’t need to be a bird expert, or go out all day long. • Get an eBird account if you don’t already have one: eBird is a worldwide bird checklist program used by hundreds of thousands of birders. It’s what allows us to compile everyone’s sightings into a single massive Global Big Day list—while at the same time collecting the data for scientists to use to better understand birds. It’s free. Log your sightings on the eBird website or download the eBird app, for maximum ease-of-use. • Watch the sightings roll in: During the day, keep an eye on how the lists are growing in different parts of the world. Follow along with sightings from more than 150 countries, including the Cornell Lab’s Team Sapsucker in Colombia, Honduras, and California. Stats will be updated in real-time on our Global Big Day page. • Explore eBird Hotspots near you. • Put your birding plans on the worldwide Global Big Day map. • Get together with friends and set a goal for your birding—most unusual species? Biggest flock? All the species in your favorite family? The possibilities are endless. • Take photos and add them to your checklist—they might end up on the Global Big Day page! • Put your birds on the map! Your sightings become part of a global snapshot that helps track the numbers, health, and movements of birds for scientists and conservationists. • It helps other birders: your data feeds migration forecasts, species checklists, and hotspot maps that are free for all. • 20,000 bird watchers around the world will be on a 24-hour birding binge; count yourself in their ranks. • In 2017, bird watchers recorded an incredible 65% of all the bird species on the planet. Can we set a new record? 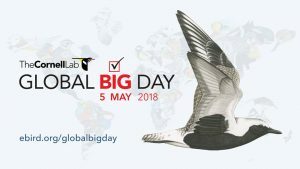 CLICK HERE to learn more about Global Big Day and eBird. And don’t miss World Migratory Bird Day! There are 1,200 events happening around the world in 200 cities on Saturday May 12, including two KBO is part of—Rogue Valley Bird Day and the Global Migratory Bird Day Birdwatching Field Trip in Shasta Valley Wildlife Area. Of course the invaluable citizen science wonder that is eBird is bigger than Global Big Day—watch the birds any day and let your observations add to our body of knowledge, empowering bird conservation science through eBird. Every bird counts so count all your birds! Announcing our always popular Malheur birding trip scheduled for June 2nd-5th, 2018! This five-day and four-night eastern Oregon birding expedition will begin with birding from Ashland to Summer Lake, explore surrounding wildlife areas, and stay at the Summer Lake Lodge. 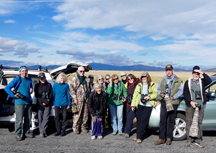 On the second day we will arrive at the Malheur National Wildlife Refuge—birding this special area the next three days with accommodations at Crystal Crane Hot Springs those three nights. Bring your swim suit as we will study the night sky from the warmth of the hot spring pool in the evenings (optional of course). One night we will have dinner at the famous Diamond Hotel. Dinners will include tallies of our birds for the day. 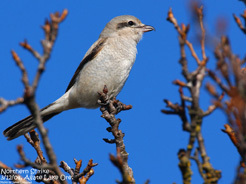 This birding adventure will focus on wintering birds of the Pacific Northwest that spend the summer in nesting territories further north. We will bird in and around Puget Sound, including Billy Frank Jr. Nisqually National Wildlife Refuge, then travel along the Hood Canal and north to the upper tip of the Olympic Peninsula. A ferry will take us from Port Townsend to Whidbey Island. 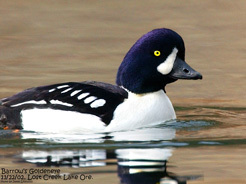 Plan to see Trumpeter Swan, Harlequin and Long-tailed ducks, Rhinoceros Auklet, Pacific Loon, Barrow’s Goldeneye, Brant, Black and White-Winged scoters, Northern Shrike, Short-eared Owl, Rough-legged Hawk, and many others. Some of the Pacific Northwest’s most beautiful landscapes will be the backdrop for fantastic birding. We may also get to see an orca pod on the ferry! Costs: Early-bird fee is $569 per person if paid by January 1, 2018. The fee includes four nights’ hotel accommodation and travel to and from Seattle-Tacoma International Airport (SeaTac – airport code SEA). Also included is the expertise of master bird guide Harry Fuller. The group will travel by van and ferry during the adventure. 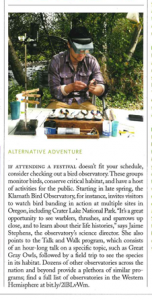 $300 of the fee is a tax deductible donation to the Klamath Bird Observatory. After January 1, 2018 cost of the trip is $619 so sign up early as it will make plane flights cheaper and easier to obtain. Reasonably-priced early-morning flights from Medford (MFR), Eugene (EUG), or San Francisco (SFO) to SeaTac are available on a few major airlines (Alaska, Delta, and American—and Southwest Airlines out of Oakland (OAK)). Participants pay for their meals and travel to and from SeaTac airport where the trip begins and ends. Due to logistics and to maximize everyone’s adventure experience the group will be limited to 10 participants. Arrangements have been made for double-occupancy rooms in the towns of Lacey, Sequim (2 nights), and Burlington, WA where we will be stopping overnights. To sign up for or more information about this sure-to-be-memorable birding adventure, contact Shannon Rio at shannonrio@aol.com or by phone (541) 840-4655. You will have the double pleasure of taking a special birding trip along with contributing to conservation as you support KBO. ***Please note—after January 1, 2018 cost of this trip will be non-refundable. Shannon Rio will help with coordinating arrival times as we gather in Seattle and any other details. KBO’s 2017 Conservation Science Stamp, featuring the Oregon Vesper Sparrow, illustrated by Gary Bloomfield. 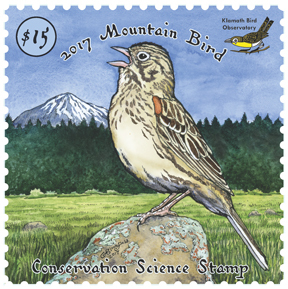 Klamath Bird Observatory’s 2017 Conservation Science Stamp features the Oregon Vesper Sparrow. We feature this sparrow to raise awareness about its peril while also showcasing steps we are making for its conservation. The Oregon Vesper Sparrow is a subspecies that occurs to the west of the Vesper Sparrow’s core continental breeding range. To learn more about the Oregon Vesper Sparrow and its science-driven conservation CLICK HERE. Klamath Bird Observatory’s Conservation Science Stamp is produced each year and sold as part of our annual Conservation Stamp Set. Proceeds support both regional and national conservation efforts. The 2-stamp set includes 1) KBO’s Conservation Science Stamp and 2) the Federal Migratory Bird Hunting and Conservation Stamp (i.e., the Duck Stamp). Each year’s Conservation Science Stamp feature a different species that KBO studies, works to conserve, and highlights through community education programs. This $15 stamp brings attention to our science-based conservation programs and proceeds support these effort. Additionally, Conservation Science Stamp buyers are offered discounts on some KBO fee-based community education and conservation birding events. The Federal Migratory Bird Hunting and Conservation Stamp is popularly referred to as the Duck Stamp. Why does the Klamath Bird Observatory sell Duck Stamps? Because we see birds and birding as our refuge, and by purchasing Duck Stamps birders and hunters alike directly contribute to bird habitat conservation efforts on our National Wildlife Refuges. The United States refuge system is one of the world’s best migratory bird conservation models. By buying Duck Stamps, birders make an important statement — we, a significant conservation constituent, hold non-game bird conservation, in addition to gamebird and endangered species conservation, as a societal priority. An additional perk is that a Duck Stamp provides access to National Refuges that charge admission or parking fees. To purchase your 2017 Conservation Stamp Set, CLICK HERE.